From an early age, Stephanie M. DeGeneste knew she wanted to be a teacher. Stephanie’s degrees include a B.A from Hunter College and a Master of Science in Education from City College Graduate School of Education. Her 43-year teaching experience encompasses public, corporate, and Christian education. Stephanie is the Executive Director & Co-founder of New Covenant Christian Association, Inc., a non-profit educational organization established in 2004 to start New Covenant Christian Academy to address the crisis in education in America, primarily among vulnerable, underserved youth. New Covenant Christian Academy, an innovative leadership academy that served students in grades kindergarten through 12, started from the humble beginnings of $250 and two years of tireless efforts. In late summer 2013, after seven years of stellar accomplishments, totally unforeseen and unfortunate circumstances beyond New Covenant Christian Academy’s control forced the board of directors to close the school. 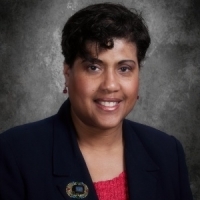 As the Executive Director of New Covenant Christian Association, Inc., Stephanie capitalizes on the experience gained during the seven years the school was in operation as the non-profit parent organization continues to be an educational conduit of transformative change, now beyond the borders of a Christian school. Stephanie has had many opportunities to be the keynote speaker at professional events. In addition to facilitating workshops on an array of subjects, Stephanie is the author of several human resource development programs, one of which is a copyrighted parenting course. Stephanie has also produced and participated in numerous radio broadcasts. Stephanie is the author of WHAT GOD CAN DO With A Slice Of Bread And A Teaspoon Of Peanut Butter, a memoir that chronicles the remarkable story of how the New Covenant Christian Academy vision became a reality. Stephanie has amassed numerous awards for her dedicated community service, among them: Somerset Patriots Community Hero Award, Mack E. Williams Memorial Foundation Sterling Award, the Barbados American Charitable Organization of New Jersey Community Service Award, and the Delta Sigma Theta Central Jersey Alumnae Chapter Woman of Achievement Award. Stephanie and her husband, Quinn, of 34 years reside in Somerset, NJ. The couple have 3 children, and 2 grandchildren.